Chester teenager, 18-year-old Hannah Jones has been named as a winner in the prestigious national 2011 WellChild Awards and will be off to collect her prize in London in August having been nominated by Torbay charity founder and hotelier Luke Tillen. Hannah, who has a cancerous brain tumour, was picked from hundreds of nominations from across the UK to win the category of Bravest Young Person, 16+ years, sponsored by AXA PPP healthcare, in these Awards which celebrate the courage of children coping with serious illnesses or complex conditions and honour the dedication of professionals who go the extra mile to help sick children and their families. The Awards are run by WellChild, the national charity for sick children. Hannah will be one of the stars of the show at August’s high profile Awards ceremony where she will be accompanied by her family along with Luke and his wife Suzanne. The awards has been attended over the past few years by many of WellChild’s celebrity supporters, including Royal Patron Prince Harry. Hannah has been battling a cancerous brain tumour since August 2008. She has had three operations to remove a 7cm tumour, six weeks of radiotherapy and over 12 months of intensive chemotherapy. During the third operation Hannah had a stroke, which initially left her paralysed down her left side, but thanks to intensive physiotherapy and a lot of hard work, Hannah learnt to walk again. Hannah has been left with left-sided weakness, but this hasn’t stopped her from enjoying life and raising funds (over £160k in total, for Alder Hey’s Imagine Appeal Oncology Fund and the Samantha Dickson Brain Tumour Trust). Babbacombe based Hotel De La Mer co-owner Luke Tillen, who nominated Hannah for the WellChild Award said: “Hannah is a very determined and amazing young lady who is determined to make positive changes and help others in the same situation she finds herself in. I first met Hannah and her family in August 2009 when they came and stayed at my hotel, they were the first family to benefit from a Torbay Holiday Helpers Network holiday. The organisation gives free action packed holidays to families who have seriously ill children, and to bereaved families and couples. 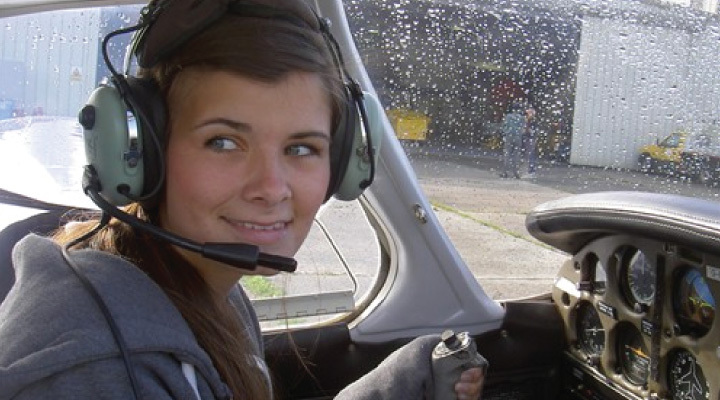 Hannah took the controls of a four seat light aircraft and was joined by her instructor, Luke and her Dad Steve. Hannah treated them all to an amazing tour over the City of Plymouth and all along the stunning south Devon coastline down to Burgh Island and back to Plymouth City Airport where the instructor took over for a safe landing. With hundreds of nominations received from across the country, the difficult job of choosing winners in all 15 WellChild Award categories is given, each year, to an esteemed panel of judges. That panel consists of members of parliament, leading health professionals and others with an interest in children’s health. WellChild’s Director of Programmes, Linda Partridge, is also a member of that panel. She said: “It is a tremendous challenge to select winners from the many, many truly amazing nominations we receive from all over the country. All the panel members are moved by the bravery of the children, the stories of selfless care and support and the dedication of the doctors, nurses, teachers, brothers and sisters who make a great difference to the lives of sick children. Hannah truly deserves to be the winner of this award. Hannah will receive her award at the seventh Annual WellChild Awards ceremony on 31st August at the InterContinental London Park Lane Hotel. At this star-studded event, Hannah will meet a host of WellChild celebrity supporters, who attend each year to celebrate the courage of brave children and honour the dedicated work of the country’s health professionals. In addition to Royal Patron, Prince Harry, previous WellChild Award evenings have been attended by rock legend Rod Stewart with his wife Penny Lancaster Stewart, footballer Jermain Defoe, pop band Scouting for Girls, Dancing on Ice star Laura Hamilton, Duncan Bannatyne, BBC presenter Chris Hollins and many more.